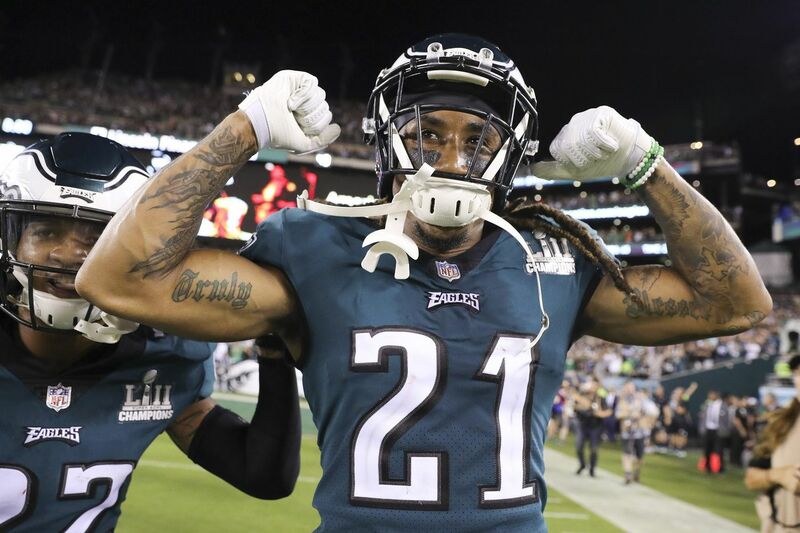 Eagles cornerback Ronald Darby celebrates after pushing Atlanta Falcons wide receiver Julio Jones out of bounds on the final play of the game. Good morning. A familiar feeling is back in Philadelphia on the morning after an Eagles victory. The Eagles opened the season with an 18-12 win over the Atlanta Falcons that offered a few flashbacks to their Super Bowl run. Doug Pederson will have a noon news conference Friday, and then the Eagles will be off this weekend before beginning preparations for the Tampa Bay Buccaneers next week. This is the Early Birds newsletter, which will arrive in your inbox Monday through Friday for the rest of the season. If your friends haven't subscribed to Early Birds, it's free to sign up here. I want to know what you think, what we should add and what you want to read, so send me feedback by email or on Twitter @ZBerm. Thank you for reading. Eagles cornerback Ronald Darby pushes Atlanta Falcons wide receiver Julio Jones out of bounds on the final play of the game. The result was familiar on Thursday. So was the resilience. Sitting by his locker earlier this week, Eagles safety Malcolm Jenkins said Thursday's game would begin to reveal the personality of this team. Last year's Super Bowl team proved to be resilient and tough-minded, but it was not a given that this year's group would have that same identity. One game isn't conclusive, but it is revealing. And what the Eagles showed in Thursday's 18-12 win over the Atlanta Falcons was what they displayed throughout last season: They just find a way. "I think it's good to see the poise," Jenkins said. "That comes from the leadership. That comes from the fact that a lot of us have been there." The Eagles won an ugly game against a good team. They made the necessary plays in the fourth quarter, they overcame mistakes, and when the pressure was on, they delivered. The way they played wasn't nearly as impressive as the way they competed. Even when mistakes accumulated or when they put themselves in bad situations (turnovers and penalties were a problem), they found a way to respond. The difference between those teams playing late into January and those that finish the season in Week 17 can often be that characteristic. "The biggest thing, again, no panic on the sideline," coach Doug Pederson said. "Resiliency. Toughness. Hanging with each other through all the ups and downs, ebbs and flows of the game, mistakes and penalties, turnover. Just the guys hanging together. There was no panic tonight." My biggest takeaway from the way they played was how tough this defense appears to be. Jim Schwartz always talks about how scoring defense is what he cares about, and that's not just lip service. The Eagles might give up yards, but they don't give up many points – especially at home. In the last six games at Lincoln Financial Field (including the playoffs), the Eagles have allowed an average of seven points. The story of the game was the red-zone defense. The Falcons made five trips inside the red zone and had only one touchdown and one field goal to show for it. The Eagles stopped them on downs twice and had an interception. That's the way to compensate for what was a sluggish offense. "It's probably the game, the deciding factor," Pederson said. "They got down there and bowed their neck and made several big stops for us. That's what it takes, I think, early in the season like this until your offense really kind of gets on track and gets going a little bit." It was not a good night overall for the offense. Nick Foles must play better, and if you're keeping track of the high-variance nature of his career, he had a quarterback rating of 50.7. But Foles also made a few clutch plays, including his third-down catch on "Philly Philly." The wide receivers need Alshon Jeffery back because of the attention he requires and play-making ability he offers on the outside. Pederson waited too long to get Jay Ajayi involved (three carries in the first half, 12 in the second half). But the Eagles talk often about situational football, and I give the offense credit for those areas. They were 2 for 3 in the red zone and 8 for 16 on third downs. Those are encouraging numbers, and if the Eagles remain efficient on third down and in the red zone, the result will look good even if there's sluggishness. That goes back to the team's resilience. After an ugly first half, they were down only three points. After two costly second-half turnovers, they still took a late lead. And when the Falcons had a chance to win in the final minute, the Eagles wouldn't let them. The front page of the Daily News on Friday morning read "DEJA-WHEW!" and the front of The Inquirer sports section read "FAMILIAR FINISH." Those are telling headlines for a game that offered reminders of last year's team. Considering that group has a Super Bowl banner hanging in Lincoln Financial Field, there's no greater compliment. Fireworks fly past the Eagles Super Bowl banner before the Eagles play the Falcons. The Eagles offered reminders of the Super Bowl team on a night when they celebrated the Super Bowl. Nick Foles wasn't Super or Special on Thursday, Jeff McLane writes, but he didn't need to be for the Eagles win. And he didn't cost them the game. It wasn't an MVP performance. It was enough to win. The defense saved the season-opening win, writes Bob Ford, who added that Thursday "certainly did wonders for anyone worried about the defense." The offensive line and running game made plays when it mattered, Les Bowen writes. The Eagles ran a variation of the Philly Special on Thursday, as Marcus Hayes writes, and it was a hit. The Super Bowl is now behind the Eagles, Mike Sielski writes. Paul Domowitch offers his grades. You can offer yours, too. Bowen has the details about what happened during the national anthem. The game was delayed because of weather. Mack Hollins went on injured reserve. Little concerned with the WR play (minus Nelson) any thoughts of bringing a free agent in to work out? Alshon Jeffery's statistics didn't resemble those of an elite No. 1 wide receiver last season, but his presence did. Defenses must play the Eagles differently when Jeffery is on the field. This is not a season-ending injury, and when they get him back, it will help the entire wide-receiver corps. There should be no concern about Nelson Agholor, and he'll keep getting better this season. Mike Wallace is very good for a team's third receiver. But they need Jeffery for everyone to fit in the right spots. With Mack Hollins on IR, DeAndre Carter, Shelton Gibson, and Markus Wheaton move up the depth chart. The Eagles had a top three of Agholor-Wallace-Carter on Thursday. That's not imposing. They can work out a free agent if they want the depth, but the best addition will be Jeffery. Do you think Jay Ajayi will have a big year ? It depends on what you consider a big year. I think Jay Ajayi will have a productive season and will be the best running back on the team. He runs hard, and the Eagles need to feed him. But I don't think he'll challenge for the rushing title. Ajayi had 15 carries for 62 yards Thursday. He'll probably get somewhere between 15 and 20 carries per game, although he's capable of handling more. He'll likely gain 60-90 yards per game, with an outlier or two in both directions. If he stays close to healthy, he can top 1,000 yards. Let's say he plays 14 games this season. He'll need to average 71.4 yards per game to get to 1,000. That's certainly possible. And if he plays 15 or 16 games, he has more margin for error. So I think he'll have a productive season. Touchdowns matter, too. He already has two. With how well Nate Gerry played does it look realistic that Kamu will ride backup with Bradham coming back? I think the Eagles will continue to mix and match personnel, so I'm not sure they need to ride just one — especially with Nigel Bradham and Jordan Hicks taking the majority of the snaps. The Eagles will be in nickel, they'll play three safeties. There won't be many snaps out of the base defense. But in Jim Schwartz's defense, he'll find a role for just about anyone who dresses. Gerry and Grugier-Hill took a near equal distribution of snaps Thursday. Grugier-Hill played 28 defensive snaps, and Gerry played 26. My guess is both will continue to have a role on defense.